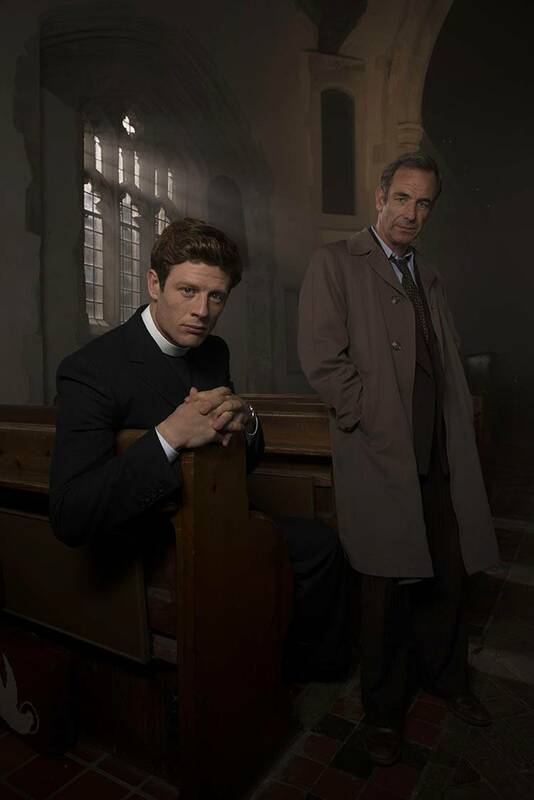 James Norton (War and Peace) dons his priestly collar and Robson Green (Reckless) his rumpled raincoat for a new season as the improbable crime-fighting team, Reverend Sidney Chambers and Inspector Geordie Keating, bringing justice and spiritual nourishment to early 1950s England. Grantchester, Season 2 airs in six exciting episodes on MASTERPIECE Mystery!, Sundays, March 27 - May 1, 2016 at 8 p.m. CT on OETA-HD. Based on the popular Sidney Chambers mystery novels by James Runcie, Grantchester was praised by critics far and wide during its premiere season. The Wall Street Journal judged it “glorious”; The Orlando Sentinel, “compelling”; USA Today, “charming”; The Los Angeles Times, “guilelessly entertaining”; and The New York Daily News, “visually engaging…romantic”— not to mention the kudos from the British press. Returning cast members include Morven Christie (Case Histories) as Amanda Hopkins, Sidney’s true love, who tired of waiting for his proposal and opted for glacial aristocrat Guy Hopkins, played by Tom Austen (Poirot). Tessa Peake-Jones (Doctor Who) returns as Sidney’s censorious, Bible-quoting housekeeper, Mrs. Maguire. Kacey Ainsworth (EastEnders) is back as Geordie’s long-suffering wife, Cathy, a harried mother of four young children. And Al Weaver (Marie Antoinette) reprises his role as novice priest Leonard Finch, who stoically faces the anti-gay hostility of the day. Last season saw Sidney and Geordie cement a fast friendship over backgammon, ale, their war service, women problems, and obsession with solving the baffling homicides that crop up in and around Cambridge—including nearby Grantchester, where Sidney is the village vicar. They make the perfect team: Geordie is a working-class police inspector who understands the criminal mind, while Sidney studied for the ministry at Cambridge University and uses his fellow feeling for humanity to get perpetrators to own up to their misdeeds. Still unresolved from last season is Sidney’s love life. Handsome, worldly-wise, and virtuous, he should be an ideal catch. And at least one very promising female companion turns up in the new series. But will Sidney scare her away with his unconventional taste for jazz, blood-spattered crime scenes, and a married woman? The new season’s cases include a shocking charge of sexual assault that turns into a homicide investigation implicating a pillar of the community; an apparent suicide from the college spire that takes on Cold War overtones; a confession to murder in which the alleged victim is still very much alive; a haunted stable with links to the Holocaust; and more. The burning issues of post–World War II Britain provide the backdrop to the action: class conflict, the death penalty, homosexuality, the looming sexual revolution, the communist threat, rationing, and the persistent effects of combat on war veterans such as Sidney and Geordie, who are just trying to get on with their lives and make society safe, secure, and a bit fun. Grantchester is a Co-Production of Kudos Film & Television Limited 2016/MASTERPIECE for ITV. The Executive Producer for Lovely Day is Diederick Santer. The Executive Producer for MASTERPIECE is Rebecca Eaton at WGBH Boston. The Producer is Emma Kingsman-Lloyd. The Directors are Harry Bradbeer, Jill Robertson and Tim Fywell. Adapted from the novel Sidney Chambers and the Shadow of Death by James Runcie, the series is written by Daisy Coulam.